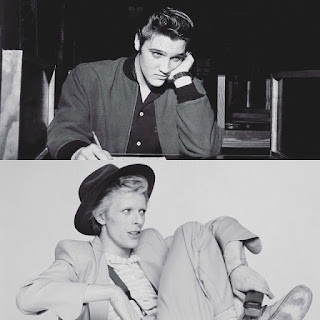 Surrender to the Void: Happy Birthday Elvis & Bowie!!! WOW, Sam Riley shared his birthday with two music legends!! Elvis would've been only 82?? Wow, I didn't realize how young he was when he died. And Bowie too, gone way too soon! Great video of the two of them, Steven! Thank you. I was watching that clip of Sam doing Bowie. I think he could play him in a film. If I ever get a chance to do that musical, I hope to cast him in one of the many Bowie personas.